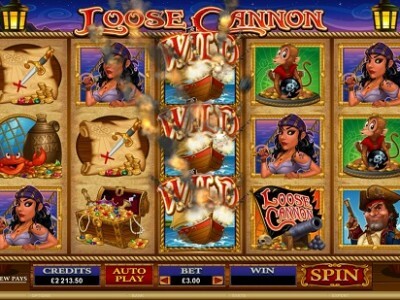 Loose cannon is a pirate themed online pokies set over 5 reels and featuring 243 ways to win. Set sail on a sea bound adventure with colourful cartoon-style images of all aspects of pirate lore. Pokie symbols include a female pirate, the cannon, wild monkey, the chest full of jewels and gold booty, the dagger treasure map, guns, and alcohol. Look out for the wild symbol which is the pirate ship as it substitutes for other symbols and helps greatly to create big winning combinations. Even better when it lands on Reel 3, it turns into a stacked wild to help create even bigger wins. Even better the Wild Pirate Ship will fire its cannons to the left and the right, and when the bombs land each symbol is turned to wild. That can result in in some seriously big wins as wild symbols are scattered along the paylines. The other way to win big on the Loose Cannon online pokies is to see 3 or more Compass scatter symbols land on Reels 1, 3, and 5. You will instantly win 15 free spins with two-way wins which payout from left to right and right to left. Set sail on a grand journey to riches when you play the fun and pirate filled Loose Cannon online pokies.